The presidents of France and Mali paid tribute on Tuesday to the role played by African troops who fought for France during World War I.
French President Emmanuel Macron and Malian President Ibrahim Boubacar Keita attended a ceremony in the French city of Reims in northeast France to pay joint tribute to the soldiers. "Today, we honour heroes," said Keita, whose great-grandfather fought and died in the Battle of Verdun nearby and whose body was never found. "The nearly 200 000 soldiers who fought day and night, who fought for France and for themselves too, for justice and liberty," he said. These "implacable" fighters, he said, had given their blood for world peace. Macron did not speak during the ceremony. But in a tweet posted Tuesday, he said that as well as the French soldiers, it was "the youth of the whole world who fell 100 years ago in villages whose names they did not know". They included "200,000 African soldiers from the colonies". 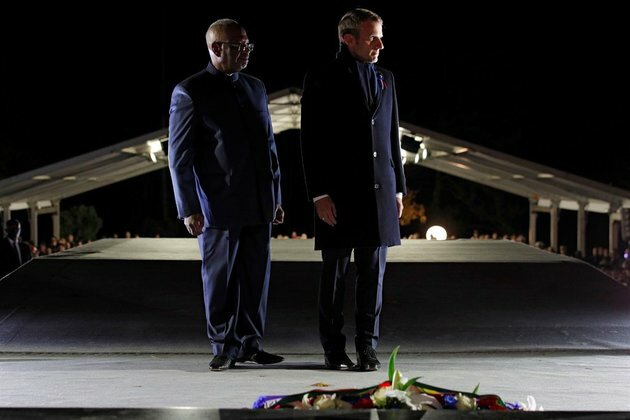 The two presidents together laid wreaths at the Parc Champagne memorial and inaugurated a monument in memory of the African troops. Tuesday's event was part of a series of ceremonies this week to mark the centenary of the end of the war. The African troops were often referred to as "Senegalese tirailleurs", or riflemen, even though they were drawn from all over West Africa. But France has long been accused of having neglected their contribution to the conflict. The role of the estimated 200 000 African troops used by France remains one of many painful aspects of the country's colonial history, which left deep resentment in Africa. In September, he acknowledged abuses by French troops during Algeria's fight for independence, and he has expressed hopes for new relationships between Paris and its former colonies, so often weighed down by the burden of history. "It's the first time we've seen a tribute at this level, what's more with an African head of state," French historian Julien Fargettas, an author of several books on colonial troops, told AFP. "You need to imagine the shock for men who had come from some of the most remote areas of Africa who are then thrown into a modern, industrial war in the West," Fargettas said. Mor Ndao, a history professor at the University of Cheikh Anta Diop in the Senegalese capital Dakar, said he believes France has never "recognised sufficiently the role and importance of the tirailleurs". What continues to rankle is the issue of military pensions - which were much lower for African fighters and unadjusted for decades - as well as passports, which were often promised but rarely delivered.